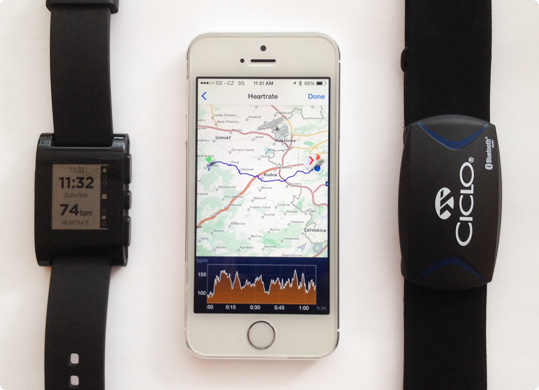 Routie 2.6 with heart rate monitoring is here! | Glimsoft Routie 2.6 with heart rate monitoring is here! Routie now has built-in heart rate monitoring support! I was reluctant at first, because I wasn’t sure if it fits into the overall vision where I want to go with Routie, but after giving it more thought and after numerous people requesting HR monitoring over time, I decided it really makes sense for Routie to fill in this gap. And I am really glad I did, because it works great and after all the testing I did, even I now take the HR monitor with me every time when I go cycling. Pair with your favourite Bluetooth 4.0 heart rate monitor. See current heart rate during your workout. Explore interactive graph of your heart rate after workout. See average and max heart rate in route details. ★ Works with Pebble! See your current heart rate on your Pebble watch. You can get the update on the App Store here. I’ve really put in a lot of effort and testing to make the whole pairing and monitoring experience a seamless one, but if you find something that’s not working as it should, please send me an email at support [at] routieapp.com. If you like the update, please take a moment and give it a comment on the App Store, it really helps a lot! Now, I would like to thank all the people who have been requesting the heart rate monitoring feature and those who helped me along the way. Specifically, I would like to thank Karel Brudný and Radek Šustek – your valuable suggestions, perspective and testing made it much better than it would have been otherwise!